Is a ten year fixed rate a good idea? Recently KBC introduced a 10 year fixed rate, they are not the first back to have done this, in the past other banks had them but their prices were high, the difference today is that you can get a 10 year fixed rate mortgage for below 3% and that means it’s worth considering. First of all, why would you want to fix for so long? 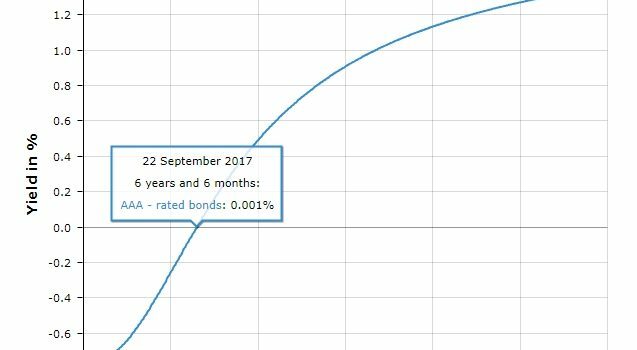 Obviously the longevity of a guaranteed price in a world where rates are expected to rise over time makes it attractive. This has to be balanced against the likelihood of competitive forces driving down Irish mortgage rates. Currently there is upside down pricing where fixed rates are cheaper than variable rates, how long this will last is anybody’s guess. What we can do is look at the yield curve in order to get an idea of when rates might go up. 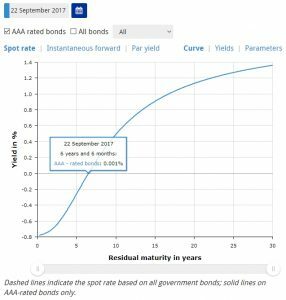 Looking at that curve today (the quote date is from the 22nd which is last Friday) we see that yields are still negative a full six years into the future. What does that tell you? It’s just a reflection of what is happening in the money markets. The Euribor curve or ‘European interbank offered rate’ is the price that money is moving about at in large inter-bank funding transactions. When you see that yields are negative it means there are certain things happening that are pushing down the expected return. Why would you give somebody money today in the expectation of getting less back in the future? There are many reasons for it, including the fact that banks can lose more money by putting excess liquidity into the ECB, but suffice to say, returns are low and if there was an expectation of interest rates rising in the near term then you’d see a different curve. If the yield curve is a crystal ball (it isn’t, but it’s the closest thing we have to one) then any fixed rate today may not be the best because rates may drop as lending heats up a little more and prices drop. That said, if it takes a year or two for that to happen and you are saving money up until that point then this has to be considered too. It isn’t the place of a mortgage broker to tell you what to do, we simply show you the best choices out there, why they are good or not and then you have to make the ultimate decision. Suffice to say, this price is a good one, the long guarantee is a good hedge against uncertainty (again, it can work against you if that uncertainty drives prices down) and with KBC there is the advantage that you can still overpay a little. With KBC you can overpay 10% of the mortgage balance over the life of the fixed rate (or about 1% of the loan per year every year for 10 years) without penalty, this makes pre-payment a possibility which is one of the main negatives when it comes to fixed rate mortgages. To get a sub 3% 10 year fixed rate you’ll need to open a current account with KBC, again, the options and choices as well as options with other lenders are best discussed with your mortgage advisor, if you are just looking around and don’t have a mortgage advisor we’d be delighted to help, just call reception and you can speak to one of our brokers, email in or apply online.